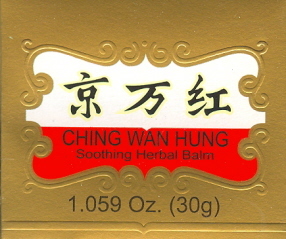 Ching Wan Hung (Jing Wan Hong) is a topical ointment for burns and scalds. Reduces pain, swelling, and blistering and promotes tissue repair. Use topically for hemorrhoids and acne as well as sunburn and heat rashes. It is also reportedly good for diaper rash. 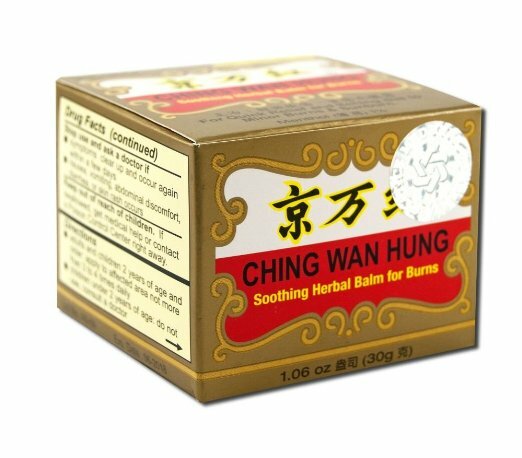 Ching Wan Hung is a good, inexpensive, emergency remedy to have on hand. Contains: Sesame oil, Beeswax, Myrrha, Angelica, Carthamus, Mastic (Pistacia lentiscus) Chaemomeles, Sanguisorba.